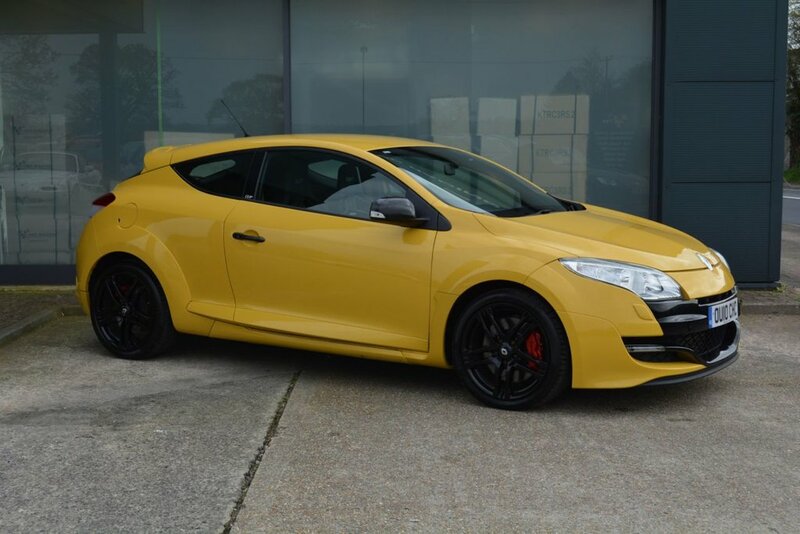 Here we have another Renaultsport Megane 250 presented in Sport Yellow with contrasting 18" Cup spec gloss black alloy wheels. This car has a great specification which includes Recaro seats, Cup chassis with limited slip differential and the Renaultsport monitor. Other features include electric windows/mirrors, trip computer, air conditioning, stereo with bluetooth connectivity, rear parking sensors and cruise control with speed limiter. This particular car is an ex Silverstone Experience car so it has been used on track, it is one of 6 we currently have in stock. It has a very comprehensive service history and has just had a full cambelt change and service in our workshop along with a full inspection, it is also MOT'd until November 2019. We have all the paperwork relating to the extensive maintenance that has been carried on this car and it will be supplied with our comprehensive extendable 6 month Premium warranty for added peace of mind. Free self adjusting finance calculator available on request, just email us for a free no obligation quote. Fully tailored low rate finance packages available with low deposit and up to 5 year term. Warranty extension from our standard 6 months to 15 months from just £149, please contact us for more information. All cars Experian Auto Check clear.